Rename "Enable Hardware Video Mode" to "Enable Exclusive Fullscreen Mode". EDIT: By default, audio will still remain muted while unfocus. Unless changed in the audio's settings dialog. Thanks to ergo720 for bring it up. I may had not find the cause at all. 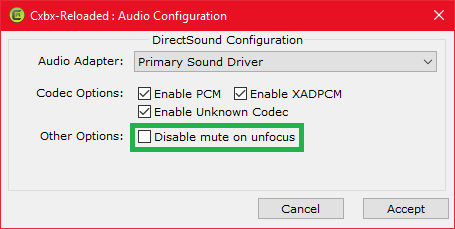 "Disable mute on unfocus" option is normally for front-end third-party and possibility some broadcast tools didn't receive audio from the emulation. Why not make a volume bar 0% to 100% to adjust the audio? Not relative to this pull request. If a flag DSBCAPS_GLOBALFOCUS is not included, then you cannot hear the audio outside of the emulation. EDIT: Volume bar may will be feature in the new GUI. Just a note. You might want to change the phrase to "Disable mute when window is unfocused" or "Disable mute on/during absence" (or "Disable mute while absent/away from window"). It's because that shortened ending "... on unfocus" can be confusing to many users. I wouldn't have been sure of what it was for if I hadn't read your post above. Unfocus is a well-known term, absent/absence/away are less clear IMHO. But to piggy-pack on this remark: This menu option could be inverted in meaning and be called "Mute when unfocused" (default on), which is much shorter, and (because like this it no longer is a double negative, and less words are used), probably much better to understand.